(Waldorf, Md., May 19, 2018) – The Southern Maryland Blue Crabs announced Saturday that infielder Joey Wong has been signed by the New York Mets organization. 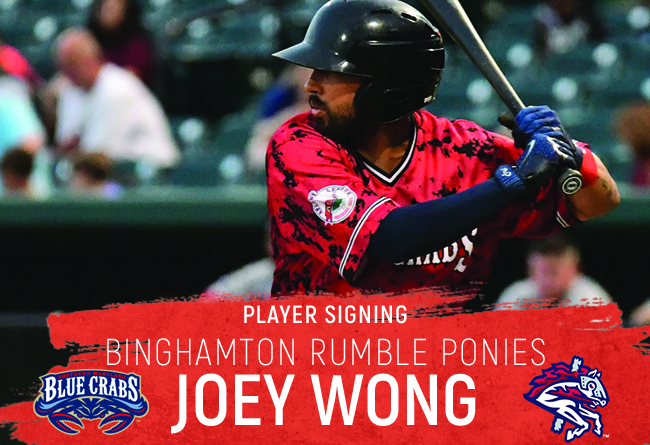 Wong will report to the Double-A affiliate Binghamton Rumble Ponies. The Oregon State alum was in his first season playing for the Blue Crabs. Wong was named an Opening Day starter for the team, batting leadoff and playing second base. He appeared in 18 games between shortstop and second base, hitting .239 with 5 RBI’s and 10 runs scored. Wong played a key part in the Blue Crabs only sweep of the season, picking up seven hits and three runs scored in a three-game series against the Road Warriors. The versatile infielder originally signed with the Blue Crabs prior to the 2017 season, but was signed by the Seattle Mariners organization prior to the start of the season. Wong spent his first eight seasons with the Colorado Rockies organization, and will now enter his 10th season with affiliated teams.